Record up to 60 second videos using your Nikon and Canon cameras as well as webcams. Upload a Pre-roll and Post-roll video as well as overlay which automatically get added to your guests’ video. Settings > Video. Include up to 12 photos per template instead of 4. Template Editor > Photo From Booth. Uploads to fotoShare Cloud (Uploads) are now included in the Sharing Status under Settings > General. Remove restriction of maximum of 10 prints per session. Settings > Printing. The ability to set a description for Facebook Page sharing has been removed due to changes in Facebook’s privacy policies. However, you can continue to share to a Facebook Business Page as before. Mojave Dark Theme is not yet supported. 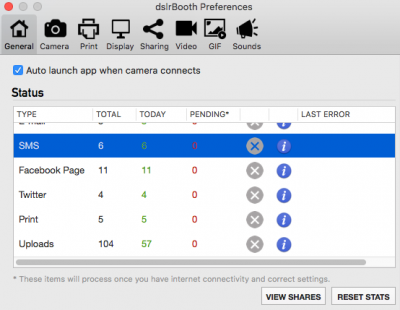 MAC OS Firewall now allows photos to download to fotoShare app automatically. Fix for Green Screen not being replaced when using certain Nikon cameras. Improve compatibility with OS X 10.14.